Highland Ave() Architect Michael Pantaluni, in conjunction with the Architectural Review committee of the Highland Park Neighborhood Association today unveiled a new automated dispenser, located outside his office on Highland Avenue, which will make architectural design much more accessible to neighborhood property owners and developers. 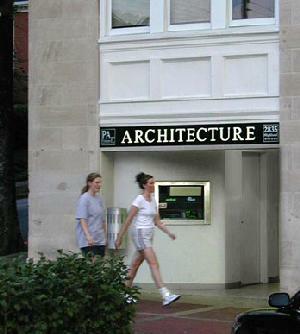 The architecture dispenser is built to function very much like a familiar automated bank teller. Any resident of Jefferson County can use their library card to gain access to twenty-four hour architectural services for a nominal fee which will appear as library fines. Users will insert their card, select a property from the database, enter a project type, occupancy requirements, and budget and within seconds a menu of preliminary floorplans and artists conceptions will be displayed on the touch-screen. Each of the four or five designs generated will conform to all applicable building codes as well as design cues taken from the neighborhoods existing structures. Compliance with the Americans With Disabilities Act is available currently as a premium option only, subject to additional charges and delays. "Were hoping to have finished reading and implementing the ADA legislation [which was enacted in 1991] by the end of next year so that the dispenser can incorporate the necessary design guidelines as a standard service," notes Pantaluni. Iris De La Tide, President of the neighborhood association noted that "...cookie cutter and rubber-stamp approaches to architecture have been attempted with relative degrees of success in the past, but were doing something here that has never been tried before -- a truly automated delivery device for quality architecture. We are all hoping that this dispenser will encourage the practice of good architecture in Highland Park just as the ATM at Sammys [Night Club] promotes increased tipping." A Birminghamster reporter who stayed to canvas the first recipients of automatically dispensed architecture collected a variety of comments ranging from "F---, what the H--- is this thing? I thought this was a bank machine," to "Hey, do you know where a REAL ATM is?" Some neighborhood children picked up a few of the artists renderings littering the sidewalk, apparently planning to color them when they got back home. Asgaard() Looking almost like a kid again HealthSouth CEO Richard Scrushy announced at a press conference today that he would be auctioning off his entire collection of X-men comics. The auction is set to coincide with the launch of HealthSouth's new Business to Business online health commodities exchange. The auction will be on one channel of the massive medical products and services marketplace which links thousands of suppliers with several large healthcare service providers. When asked how the X-men tied in with an essentially healthcare oriented site Scrushy responded, "It has everything to do with healthcare. I mean look at the incredible regenerative powers of Wolverine. Who wouldn't want to own that? And how many uses for Mystique's shape changing ability can you come up with? Besides in order to list your products on the exchange, you have to buy one of my comic books." One local lawyer who has expressed concerns about this business model is Judy Thompson. "This X-men purchase could be construed as a bribe required to do business with the big boys. This kind of business tactic would not stand up to the fair and open bidding laws in most states. In fact it defeats the whole purpose of the B to B as an open marketplace." "She's just jealous that Adamantium is stronger then Femininium," replied Scrushy. "Have her come by after one of our board meetings and check out my Magneto. Then see if she still feels the same way or just feels sore." The HealthSouth website shows Scrushy's massive X-men collection, including issues #1 through 44 in mint condition with issue 45 listed as VG+. A special "Secret Wars" section details many special issues and cross appearances by the mutants in other Marvel comics. Scotsboro() The Unclaimed Baggage store off Highway 79 in Scotsboro is famous for its material finds, but amongst the clothes, electronics, and jewelry on those cavernous loading docks also sits piles of discarded emotional baggage. For every walkman there is a forgotten anniversary, for each worldwide power adapter there is too much time spent at work, and all those Harry Potter books are matched by missed soccer games. Like most of the 60 million other items that have found their way to Scotsboro via unclaimed baggage rooms in airports nationwide, this emotional baggage is offered to the public at a deeply discounted price. Shoppers like Louisa Salmoneo, who thought she was on her last nerve until finding a boxful discounted to $4.00 on the shelves at Unclaimed Baggage, returns frequently to search through new shipments. "These nerves are a little bit frayed," said Mrs. Salmoneo, "but I will mend them and be ready to face my family again tomorrow." "Emotional baggage is an ever increasing fraction of the total amount of 'stuff' that is brought on board airliners today," offered Greg Antwerp, a baggage-claims consultant for the Birmingham International Airport. "These days you have people boarding planes 'just to get away' from the stress of daily life, and yet, just as people can't leave their cell-phones and alarm clocks when they hit the beach, they don't seem to be able to shed their emotional baggage before heading to the airport." But usually emotional baggage is the first thing to be left behind in the event of heavy turbulence or engine failure. Psychologist Robin Cooper-Dudley has shown that in near emergencies, people have a tendency to see a much clearer perspective of their lives. "When the mind reaches out to the sheer joy of living, the emotional baggage just slips away." Apparently it often slips into the under seat storage areas and seatback pockets where airline personnel find it, usually unaccompanied by any means of identification. The fact that so few people contact airlines to claim lost emotional baggage only increases the amount that is delivered to Scotsboro for resale. 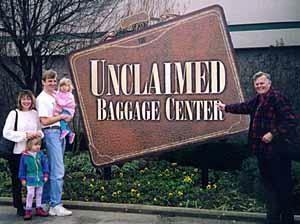 The Unclaimed Baggage Center, in operation since 1978, is open 6 days a week and receives new shipments daily. Assistance is available for the emotionally handicapped.